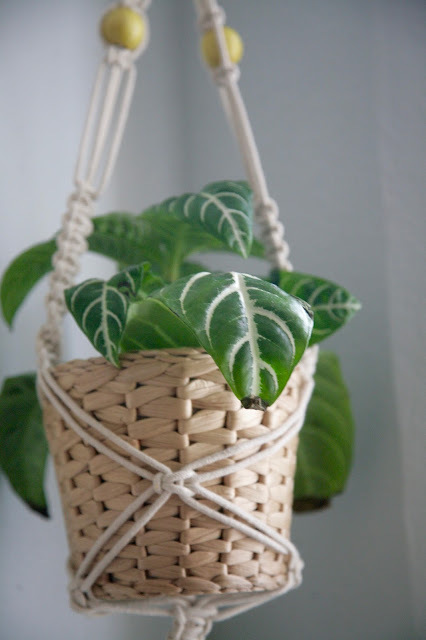 Inder Loves Folk Art: A Macrame Plant Hanger, window shelves, and some tips for happy houseplants! 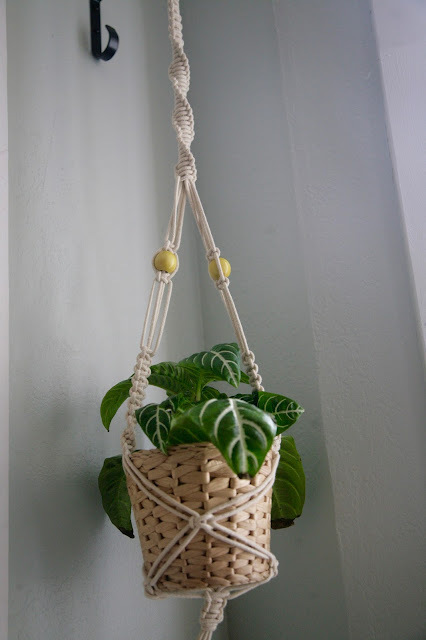 A Macrame Plant Hanger, window shelves, and some tips for happy houseplants! Gah, I love that kitchen! Seriously! Anyway, houseplants are totally in right now, but being a snob, I feel that I must tell you that I am no fair weather fan of houseplants. Or 1970s decor. Oh wait, you probably know that by now, huh? Sometimes it's a little annoying when everyone on the planet decides that your favorite thing is the latest trend. On the one hand, it's vindicating: "I told you macrame was cool!!" On the other hand, it means it will be going out of style before long, and that's a little sad. Anyhoo. 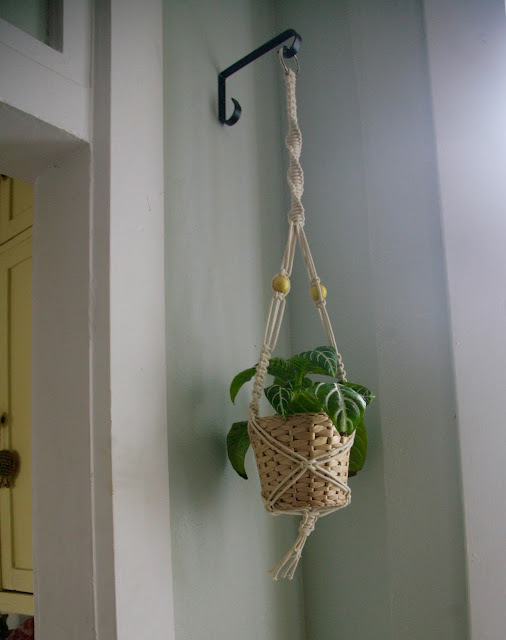 I made a macrame plant hanger! So macrame turns out to be a total piece of cake! The motions of square knotting came back to me immediately, and the thick cord or jute is so fast and easy to work compared to the embroidery thread I used to make bracelets. This kind of macrame is really three-dimensional and fun to do. I had put off learning how to macrame because I felt like I was maxed out on hobbies, but this is so easy and fast, I don't know that it even qualifies as a new hobby! I am not sure if it's because it's just plain easy, or because I learned the basic skills at a time in my life when my brain was especially fresh and open to learning new kinesthetic skills, but it just came very easy and naturally to me once I got into it. 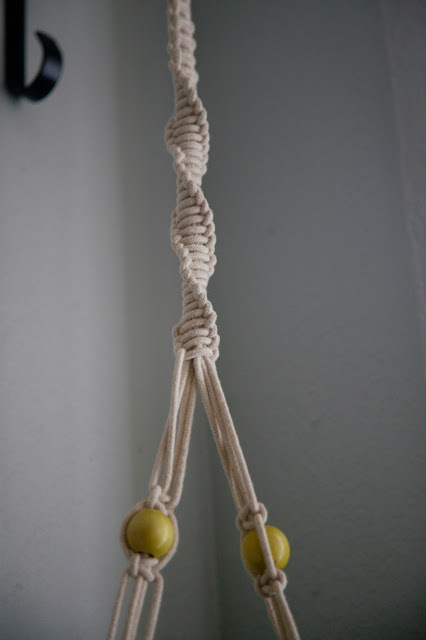 For this hanger, I used some heavy cotton rope/cording I found at Michaels. I am looking forward to trying out some actual Macrame cords and jute/hemp. Did you know there is a Macrame Super Store? As much as I love the 70s, I can't imagine life without the internet! To make this hanger, I combined techniques from several DIY instructions I found online (if you'd like more information, let me know, and I'll send you some links), changing things out along the way. Basically, the top starts with alternating square knots, then switches to one-sided square knots, which naturally spiral around in a pleasing way. When you've reached a good length, you split the strands up, skip down a bit, knot, add beads, knot, skip some more, and do alternating square knots. Once I got to the pot part, I started working around my little planter so that the final hanger would be the right size, and did square knots where it made sense. It was all very intuitive and fun! I finished the bottom with some square knots and a little tassel. This is definitely not the last macrame object you will be seeing from me - this is FUN!! - but Steve has indicated that there is a limit to how many macrame hangers he can tolerate around the house. Apparently he is not completely on board with turning our house into a groovy jungle pad? And surreptitiously installing hanging plants all over the house would be difficult due to the height of our ceilings and the noise of the equipment! So some kind of compromise will have to be struck. In the meantime ... I am getting excited about macrame wall hangings (check out my Pinterest board)!! Steve will surely live to regret forbidding me more hanging planters! 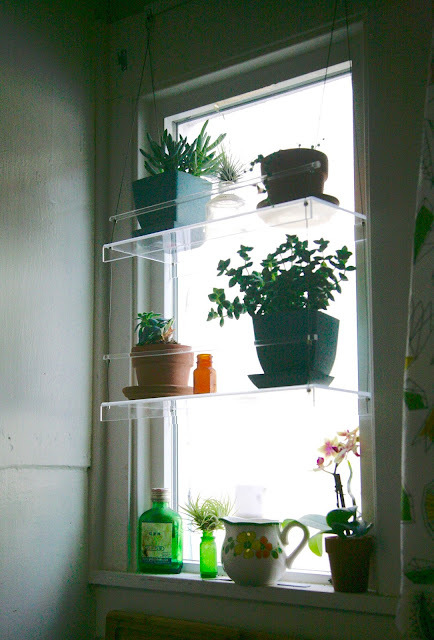 Speaking of my large collection of houseplants and my wonderfully tolerant (slightly martyred) husband, I ordered these acrylic window shelves from this totally awesome Etsy shop so that I could turn a small, non-functional kitchen window into a lovely place for plants and knick-knacks. I can't recommend this small family business enough. They custom made shelves to fit this awkward small window, and because the shelves were so small, gave me a great price on the set. (Overall, their shelves are not super cheap, but they are custom made!) We just had to install the shelves with hardware that was included. These shelves turned an ugly window with a crappy view of my neighbor's driveway into something I love to look at! The little bottles, by the way, are things we've dug up in our back garden in the years we've lived in this house. Steve actually got me the tiny orchid in the bottom right for our anniversary, and it fits perfectly beneath the bottom shelf. Isn't it the cutest thing in the universe? He may not love the 70s like I do, but he knows what I like. Little touches like this go a long ways towards reconciling me with my surroundings, imperfect and messy as they are. I love pretty things, and one of my rules of life is that loving beauty is not shallow. Sometimes it's easy to write off home decoration or pretty things as an unnecessary luxury, and certainly spending a heap of money on matching furniture is unnecessary for most of us, but a few pretty things can really help a place feel like home. That's how I feel about houseplants. In addition to cleaning the air, they really add life and beauty to a room. As a person with a houseful of plants, I often hear from a lot of friends that they have "brown" or "black" thumbs and "kill everything." This tends to get me on a bit of a high horse, because I love plants and have gardened most of my life. It triggers one of my favorite lectures: "Learning how to take care of plants is not something that comes naturally to some people but not to others - like most things in life, it's a skill, and anyone can learn it!" I think some people say that they have black thumbs when what they really mean is "I don't care that much about plants, and I'm not willing to put the effort into keeping them in my house." To them, my lecture above is probably annoying, and I just want to say, if that's how you feel, that is so COMPLETELY FINE. For heaven's sake, none of us can learn or be interested in everything! Some people love having a great-looking, clean, detailed car. They purchase a car that reflects their personality and they spend time taking care of it. I am not one of those people. I buy my car based on gas-mileage and reliability, not looks. I wash my car once every couple months at most, and the inside tends to be littered with sweaters and toys and the floor is covered in squashed cheerios. And as long as I can give someone a ride someplace without extreme shame (and I am not very easily embarrassed), I really don't care! Maybe you sew and knit and bake cakes, but don't do plants. Totally fine. That doesn't mean you have a black thumb, it just means you have other priorities. But if you are one of those people who says they have a black thumb, but you wish you had a green thumb, then listen up! It's not magic! There's no such thing as a "black thumb" (although there are certainly forgetful people, or people who don't have time for plant maintenance), and most "green thumbs" kill a lot of plants! A friend recently mentioned that she is coming to see houseplants as "long term flowers." If they don't survive for years, no big deal, they were still a good deal for something that adds a little life and interest to her house for a few months. I love this, and I think it highlights a difference between gardeners and non-gardeners - gardeners know that some plants are going to die, and they don't take it personally or assume that because they couldn't keep a specific plant alive, that they have a black thumb. In short, they take failures as par for the course rather than a sign that they should not be gardening. So, after growing houseplants for years, I have a couple of pointers, which I hope you will find refreshing and labor-saving! Rule Number One: Most people kill houseplants with too much water (or by putting them in pots that don't drain). Put your plant in a pot that has good drainage, don't let them sit in water, and don't overwater. I water my plants once a week (less for succulents). Don't love your plants to death! Most plants (not all, but most) do better with neglect than over-attention. Yes, you heard that right: You will kill less plants by forgetting to water than by watering overzealously. One of my rules for my outdoor garden is "Figure out what grows well in your climate, and then grow lots of that." I mean, if you want to spend hours everyday babying your brussel sprouts, have at it. I'd rather sit and drink a beer and watch the plants take over the back yard, myself. This rule holds indoors as well. While I like to keep some more "difficult" houseplants around because I enjoy a challenge, most of my plants are practically neglect-proof: Spider plants, pothos, succulents, umbrella plant, philodendron. If I catch the flu and miss a week of watering, they will survive. If you like pretty coffee table books, check out The Indestructible Houseplant - it's beautiful to look at and full of really sturdy plants. Brown spots on the leaves are almost always a sign of overwatering, see above. Make plant care part of your regular routine. I water plants on Saturday, when we clean the house. It's easy to remember because it's part of a routine. If you can't remember when you last watered, that is going to make it a lot easier to overwater plants or forget to water them altogether. When in doubt, don't water unless the top couple inches of soil are dry. I only have a couple of plants that would probably like to be watered more frequently than once a week, and mostly, I just make them wait. In general, I have the best luck indoors with glazed-outside, unglazed-inside ceramic pots that have a separate dish or saucer to catch the water. Unglazed ceramic dries out too quickly, and plastic tends to stay too wet. If you do use ceramic pots (which are also really pretty) you might want to use a little cork coaster underneath the saucer to protect your surfaces, because ceramic is porous. I put gravel or pot shards at the bottom of my pots under the soil so that the soil doesn't drain out as well as the water. For looks, I also like plastic pots and a saucer inside a basket weave planter. Pots and planters are a great thrift store score (I wash pots in scalding hot water if they've been used before hoping to kill any disease or bugs.) Garage sale or free plants are a more risky score because of the possibility of bringing disease or bugs home where they could hurt your other plants. Beware the kind of pots that have the dish attached to the pot. Unless you're careful, your plant will end up sitting in water. I have a few of these, and I pick them up and tilt them over the sink to empty out the tray every time I water. They seem really practical, but actually they are more work! If a plant is not doing well despite appropriate watering, chances are good the issue is light. Try moving your plants around the house and try out different spots. My living room windows are really hot and tend to burn all but the sturdiest plants, but the dining room windows are perfect for almost anything. The kitchen is better for lower light plants. The funny thing is, all of these windows face the same side of the house, it's all about the shade cast by our neighbor's house. One thing I enjoy about gardening, indoors and out, is that it makes me a lot more aware of natural light patterns. It goes without saying, if you have houseplants you need to open your curtains during the day so that they get some light. Just this tends to cheer the house up, so the plants are a good reminder. If you move your houseplants outdoors, put them in a pretty dark, shady area. Most houseplants will fry in outdoor light or sun. Ask me how I know! With the exception of African Violet, which doesn't do well with water on the leaves, I like to give my plants a bath in the sink every once in a while, to wash dust off the leaves and give them a thorough watering (I leave them in the sink to completely drain before putting them back in their spot). 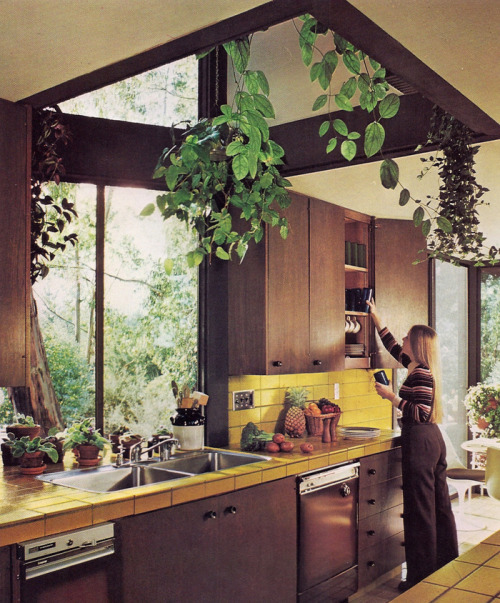 This is optional and you don't need to do it, but I really like seeing my sink filled with green plants - it's kind of 70s jungle-pad - and the plants look nicer if they aren't dusty. I think that's it! Instead of poring over books about how to grow exotic houseplants and address the many possible fungi and insects and disease that can afflict them, I've decided to grow mostly easy houseplants, toss ones that aren't working out, let things dry out between watering, and just not worry that much! For the record, there is a limit to how many plants I can take care of - there is a limit to how much I can take care of, period! 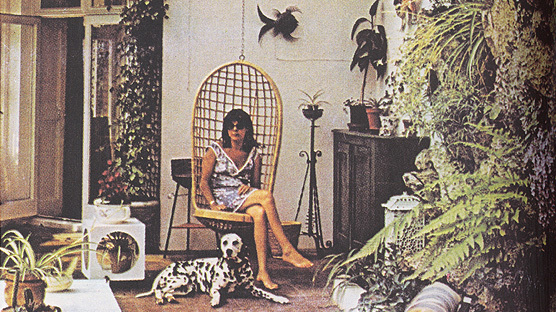 When I had two dogs, and a toddler, and a newborn - let's just say only my hardiest plants survived that period of my life (an aloe and an umbrella plant were among them, fyi). It turns out that my ability to nurture living things is in fact finite (one of several reasons I will not be having 19 children!). If your nurturing capacities are currently maxed out, don't worry. Keep your kids and animals (and yourself) alive as best you can, and don't worry about plants. There will be time later. No pressure. I have a suspicion that the 70s pads shown above (at least the top two) were childless pads! But when you realize that most plants can actually survive a lot of neglect, and that you're most likely to kill them by paying too much attention to them, and even if they do die, who cares, it's just a houseplant! - It is rather freeing, I think! I am by no means an expert in any kind of gardening - I'm a lazy person who likes looking at plants. So I hope these tips help you relax and enjoy your houseplants rather than having them become yet another stress in your life. This ended up being a long post!! Are you a lover of all things green and growing, or one of those people who believes they have a black thumb? Nice planter! This is absolutely my approach. Only the strong (houseplants) will survive. We don't have a ton indoors right now due to a lack of safe-from-toddler spots to put them, but I'm working on my hanging plant collection. So I am guilty of having used the "black thumb" excuse when it comes to not only house plants, but garden flowers. It turns out, though, that I can muster the motivation to take care of a plant if it is going to produce something I can stuff my face with. This year will be my fifth as a vegetable gardener - but I still find it to be way harder indoors. When we lived in Georgia a super-thoughtful friend bought us a potted lemon tree. I brought it inside as directed during the winter and it totally died. Same happened to the basil I grew our first summer there and tried to bring indoors when it got cold. And my attempts to start tomato seeds indoors last year was a total flop (turns out I really need grow lights, and that seems way more annoying to me than just buying tomato starts along with all the other less-hard-core gardeners). But we ate some yummy garden tomatoes and cucumbers last year and are trying a few new crops this year. Well, thank you Inder, for this lovely and informative post! Seriously awesome of you to take the time to write it! I would someday love to have a few houseplants, when we are at the stage when my kids won't try to uproot them. I think you must have a natural talent for macrame! It does not look easy at all to me. And that friendship bracelet story made my heart hurt. Gosh, am I glad I don't have to live through that period of my life again! Oh, I can't tell you how many friendship bracelets I made back in junior high. I should try out macrame, too, because I LOVED making friendship bracelets. I grew up in a house with only one or two plants and I've only had a few plants in my adult life. My husband gave me an orchid when we were dating and I kept it flowering for a few years, but it apparently only liked my kitchen table at the house where I lived before we got married. Once we moved that orchid withered. I would love to try a few new plants-- I bet my boys would love to help water them each week. Oh, and after a I saw your mini orchid on Instagram I bought myself one. I'm crossing my fingers I can keep it alive! 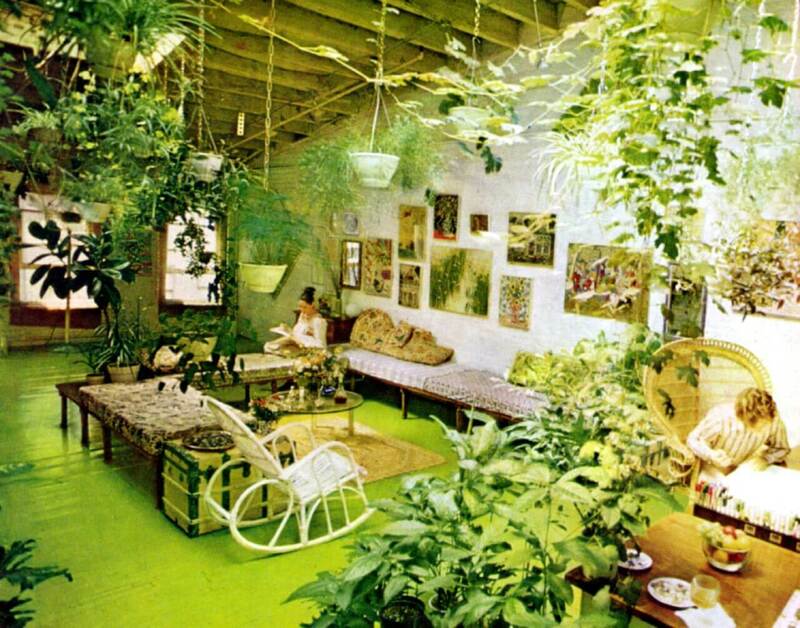 Many moons ago, when I was a hairdressers apprentice and renting the crappiest flat ever I filled it with house plants. I loved them. As I had children and acquired cats (that would eat said plants and vomit them up around the house) I started out door gardening. I had a very fancy garden and then our water went saline. Now I have a few veggies and herbs but that is it. I have noticed the macrame bug on Insta but I must admit it has not bitten me, yet! Great post, good read, thanks Inder.